Virat Kohli is an Indian international cricketer, who was the captain of the victorious Indian team at the 2008 U/19 Cricket World Cup held in Malaysia. He is a middle order batsman, who can also open the batting. He can also bowl right arm medium pace. Currently , he represents Delhi in first-class cricket and plays for Royal Challengers Bangalore in the Indian Premier League. He also played for the West Delhi Cricket Academy. Daring, tough and fiercely talented! Virat Kohli is one of the emerging faces of Indian cricket's next generation. The likes of MS Dhoni and Yuvraj Singh were all that and more when they first donned blue flannels for India, but this lad has broken the mould to carve a niche for himself. Kohli's claim to fame came when he captained India's World Cup winning U-19 side and was immediately propelled into the Indian Premier League in 2008. Devoid of noteworthy performances in the tournament, his domestic form still won him an India ODI cap on tour to Sri Lanka. The Delhi lad was initially deployed up and down the batting line-up, from replacing Virender Sehwag as an opener to accelerating the middle-order momentum. After 25 ODI innings, he had already amassed 10 fifty-plus scores including two centuries. An assurance evident in his shot selection and footwork, he was rarely found wanting with his technique even on bowler-friendly surfaces abroad. Sure, there have been dull phases in which he performed below par, but he has so far managed to bounce back from every rut that he's fallen into. He had a marvellous 2010 where he amassed around 1000 runs in a calendar year and continued his form in 2011 by scoring a century in his maiden World Cup match against Bangladesh and was a consistent contributor with the bat throughout the tournament. Often compared to Rahul Dravid for his sound technique, Virat Kohli could well mould himself into a new-age anchor for India. Virat Kohli has said his first Test century is all the more special because he had to go through a verbal barrage from Australian fielders to get there, and that he gave it back verbally and still got there. He also spoke about the abusive crowds, which he said was an uneven battle because the crowds get away with it and the players end up getting fined or banned. "Ishant and me both came together, and started saying stuff to them. They got really pissed [off] with it, I guess, and I usually play my cricket like that. I gave it back, so whatever happened at the end of the day I am pretty happy with what I did." 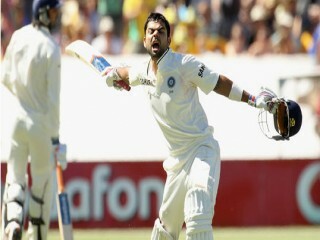 View the full website biography of Virat Kohli.